Mishaneh Makom Mishaneh Mazal: I was framed! On January 29th I entered Hadassah Ein Kerem hospital for a major surgical procedure to correct a deformity in my right leg. You may read my previous posts for more information about that deformity and about my travails dealing with the medical system here in Israel where I now live. I went to the hospital by taxi,(costing me a pretty penny), armed with a walker, all my medical records, a few changes of clothing and underwear, some toiletries, my cell phone, and eReader. And of course, a certain amount of confidence mixed with trepidation. I went alone as I was unable to arrange for a family member to accompany me. This is Israel and life in Israel can be rather inconvenient under the best of circumstances, and this was not one of those times. However, I was able to arrange for a very good friend to be there for me when I came out from under. I chose her not only because she is a good and dear friend and because I trusted her implicitly, but also because it so happens that by avocation she is a health information management expert, and by experience she has intimate knowledge of the Israeli medical establishment and system. It also did not hurt that she speaks Hebrew fluently. I have a pretty good grasp of conversational Hebrew, and she would later write in an update to my friends and family that “her Hebrew is good enough for her needs”. As promised she was there when I came around. After I arrived at the hospital and went to the Orthopedics ward I was checked in and assigned a room. I was shown where to put my things – there was a safe in the room with an electronic keypad with which I was to create my own passcode. Unfortunately, the safe’s locking mechanism was broken and I was unable to lock it up. I thus refused to leave the room until it was either fixed, or I was moved to a room with a working safe, or some other viable alternative was offered to me for the security of my cellphone, eReader, and cash/credit cards. I left my jewelry at home. The aides came with the gurney to take me to the OR, but I refused to go. They kept telling me “but they are waiting for you in the OR”. I would not move, and said, not until my belongings are secure. One of the nurses suggested I leave the stuff in a bag at the nurse’s station. I asked if she would take responsibility for my things to which she replied, “no way!”. Again I refused to move. Finally, they brought in security. After a failed attempt to fix the safe’s locking mechanism, they used a key to open and then lock it. But they would not give me the key (it is a master). But, they agreed to take responsibility for my things. And so, I agreed and then was on my way. Interestingly enough, I was still pretty calm and not so scared at this point. Last month, when I had been originally scheduled for the surgery, I had been far more nervous. (Read previous post to learn why that surgery was cancelled at the last minute). I was brought to the prep room that is directly before the OR. There, I was prepped for the surgery. Connected to IV. Last minute vitals read. Then the anesthesiologist arrived. We spoke briefly and then I was brought into the OR and placed on what I can only describe as a board. People refer to this as the operating table but it was little more than a board. Since I had elected to use regional anesthesia, an epidural, I was first instructed to sit on the board, legs hanging over, hands on my knees and then to lean over a bit while the lumbar puncture was made. After successful insertion of the catheter for the administration of the epidural, I was told to “sit up straight” and then I began to feel an icy cold liquid begin to course through me. Before I move on, I want to remind my dear readers that I am severely to profoundly hard of hearing and wear hearing aids. But for the surgery I’d been told to remove my hearing aids and they were locked up in the safe. (At a cost of appx $8000 USD of course they would be locked up!) Without my hearing aids I am functionally deaf. So all of the input I was experiencing at this point was visual, or via my sense of touch, or smell. Taste was not on the menu here! Shortly thereafter I was told to lie back on the board. By now I was shivering uncontrollably, teeth chattering audibly. My arms were placed on boards perpendicular to the one on which I now lay, and strapped down – a surgical cross or crucifix, if you will. Then, I began to feel slightly “woozy” which indicated to me the beginning of the administration of a sedative, as per agreement I had with the anesthesiologist. I had told him that I wanted to be as unaware as possible of what was going on. I thought it would be too scary for me otherwise. After that moment I remember nothing of the surgery (although I discovered some vestigial memory, about which I will write a bit later on). My memory of being in the recovery room is somewhat vague. I do know that I was after a while somewhat lucid, I vaguely recall my surgeon coming to check on me, and I recall talking to Yocheved, and being shown my PCA –although perhaps that did not happen until I was safely ensconced in my room. I will have Yocheved add to this to fill in the gaps where my memory has lapsed. I also do remember being told that the anesthesia stopped working at some point but everyone was quick to tell me that it was already after the surgery had been completed. But I fear I went through some real trauma beyond what was expected in terms of pain that I was feeling. That fear is fueled by some of the “nightmares” I have had subsequently in which I seem to be in a dark, cold place and I experience the feelings of my body being yanked and clamped and invaded – and during which I experience a real full body “jerk” in my sleep that wakens me. As mentioned before, I was given PCA (Patient Controlled Anesthesia) of morphine. I think it helped me. It is hard for me to know. I was still bedridden and suffering the indignity of wearing a diaper. Gosh those things are HUGE! Initially I seemed to be unable to urinate—which I was told is a “side effect” of the medication. I felt enormous pressure on my bladder and it was overwhelmingly uncomfortable. I found that I had to “help myself along” by using my hands to press down on my bladder. (Is this TMI? If so, sorry – but I feel that these are details that no one discusses and so the reality of what one can expect to experience remains a secret. The unknown can be very scary, at least for me. I prefer to know more rather than less. Some of my memory in terms of the sequence of events is a bit hazy. My friend went home early Tuesday evening (at my urging as I knew if she stayed longer she would have a harder time getting home – she was dependent on either public transportation, or “tremping”, the Israeli term for hitchhiking). I think I slept well that night. 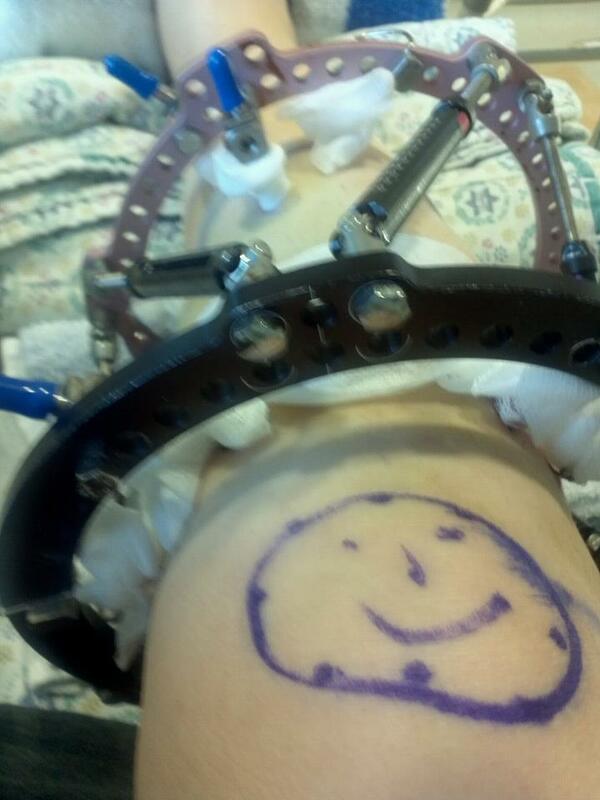 In the morning I woke in pain but a few presses of the “pain pump” helped me with that. I do not recall if it was on Wednesday or on Thursday that I asked to be taken to the bathroom using the special wheelchair with a hole in it that can be wheeled right over the toilet. I THINK I did that on Wednesday. I do remember that when my surgeon came round to see me and I told him that I was using the toilet and not a diaper he was quite surprised. He had not expected that I would attempt being “up and about” so quickly. It was not until the next day, Thursday, that the physiotherapist came around to see me and to begin his treatment with me. I remember I was terrified of it. I had, at that point been taken off the PCA and given a round of drugs which I could (and would) take. The main pain drug I was given is Targin which has oxycodone and naloxone. I was also given Optalgin (dipyrone- an analgesic). I have limited my intake of this and I may substitute Tylenol for this. The third drug for pain I am given is Percocet. That has Tylenol in it and more Oxycodone. I guess I have to be careful of the amount of Tylenol I ingest. I only take the Percocet “as needed”. I have been limiting myself to taking it only once a day. I think I would deal better with the pain if I took it once in the morning and one at night. I might do that and stop the Optalgin altogether. Other meds I am taking are Clexane, an injected drug once a day that is an anti-coagulant to prevent blood clots, and vitamins D and C and Calcium, and Cefurax, an antibiotic. I have added the homeopathic Arnica to this. Arnica is supposed to promote healing of muscle and bone tissue. 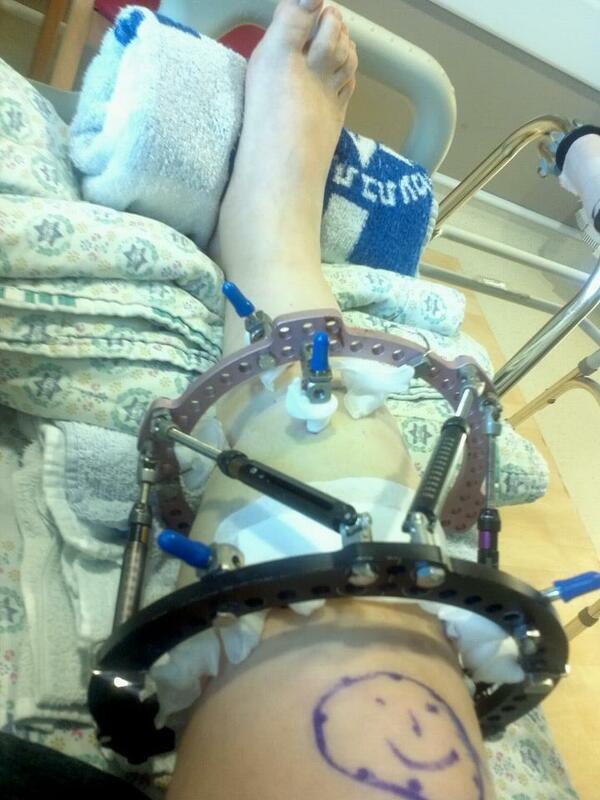 I also must change the dressings on my pin sites 2x a day. Anyway I made sure to take Percocet about a half hour before the physiotherapist was due to see me. I figured, rightly, that it would make it easier for me to do the exercises which he would surely give me. It was VERY scary for me to take those first steps, albeit with a walker. I am not putting full weight on my leg, I cannot do that, but partial weight. It is scary and, without the Percocet, painful. But I am doing it and putting myself through more exercise by taking “walks”. I would walk the length of the corridor and back. It might take me a half hour or more to do it and I would be EXHAUSTED at the end, but I feel that it is very important for me to remain active. On Wednesday morning, when my surgeon came to see me, he told me, upon examining my leg in the frame that the rotation looks good, but the angle may need some correction. On Friday morning when he came I told him that I agreed that the angle did not look right. He said he would fix it on Sunday morning. I said no, I wanted him to fix it right then and there. He told me it would hurt a bit and I smiled and said, I just took Percocet. Strike while the iron is hot. He went and got his wrench and made the adjustments. It did not really HURT, it just felt like a lot of pressure on my leg and was not comfortable. But I am glad I insisted on his making the correction sooner rather than later. It made it easier for me to straighten my leg at the knee – I would not be able to have x-rays until I could do that satisfactorily and I would not be able to go home until x-rays could be taken and they were satisfactory. On Sunday morning I was taken to the X-ray dept. I was told I would need to stand with my knees straight for the x-ray. No problem, or so I thought. Upon arrival I was asked to “please step up onto this (little itty bitty) stool” for the x-ray…! Well, there was no way I could do that. I had not brought my walker or crutches with me – I had not been told I would need them and there was nothing for me to grab hold of, to put my weight on so I could LIFT myself into that position. Finally, the aides there were “helping” me get up but they were so inept that I inadvertently wound up putting my FULL WEIGHT on the broken leg! I SCREAMED, and nearly passed out, but hyperventilated instead. Finally, though I was in the right place and I stood there, stony faced and ANGRY. There was NO REASON I should have had to endure that. I also asked to be brought to the offices of Yad Sarah. Yad Sarah is an organization in Israel that helps to provide medical equipment and supplies to patients who need them. They actually do it for free, but one must pay a nominal fee to borrow an item – a fee which is reimbursed to the patient upon return of the borrowed items. I needed crutches as I had thought only to procure a walker prior to the surgery. I knew I would need the crutches to learn how to navigate stairs. An aide brought me down to the Yad Sarah office where I not only arranged to borrow a pair of crutches, but I also arranged for purchase and delivery of a showering chair. I could not borrow one as they did not have the kind that would be good for my needs and that would fit in my bathtub or shower! It was not so expensive (about $63 USD) and when I no longer need it I will likely donate it to a “gemach” here on the Yishuv in which I live (a Gemach is similar to the Yad Sarah service but they do not always require a deposit for borrowing. A Yishuv is a village.). Later that afternoon, my surgeon came by and told me that he saw the x-rays and told me “they are PERFECT” and “you can go home tomorrow”. Of course, I was ecstatic about the return home but still worried about the issue of the stairs. There is a double set of wide stone stairs that leads (down) to my home. I still had not learned how to manage them. The next day, in the morning, the PT came by and I told him he had to teach me to use the crutches and do stairs. He brought me to the PT room and began to teach me. In the hospital the PT is allotted only twenty minutes to spend with each patient. He stayed with me for a half hour. It was TERRIBLE. I absolutely could NOT manage the stairs. Believe me, I tried hard. So hard that I was DRIPPING sweat, I was SOAKED with sweat. In the end, I collapsed, crying. I finally realized that I was going to have to ask for a couple of friends to physically help me down the stairs to my home. My very good friend Moshe Fuld came. Upon arrival home I discovered that my memory had been faulty and that there actually was a railing on the stairs, albeit on only one side. Using one crutch and the railing I was able to make it down. At the point where the staircase took a turn, the railing disappeared. My friend Moshe was my “railing”. I leaned on him for each step the rest of the way (about 6 steps). It turned out not to be as bad as I had feared. But I knew that would not be able to manage the stairs inside my house – a half a flight down to the laundry area, guest room, and more importantly, my office. I spoke to my son in law and just this morning he moved my computer and phone upstairs to a corner of the salon. It is not ideal but it will suffice until such time as I am able to manage the stairs. And this is where I am at now…I am home. Figuring things out, best ways and means of accomplishing my daily tasks, managing my pain, etc. Rachel: Please be VERY careful about adding Tylenol, especially if it's already in another medication. As you seem to be aware, too much Tylenol can permanently and irrevocably damage one's liver (yet people unfortunately think of it as the "safe" OTC medication). And it's often included in other medications, so teh amount is hard to judge. In any event, it's difficult to figure out a safe maximum dose for a particular person. They say that, for "the average healthy adult" (male, female? What size? How healthy? Anyone want to risk their liver on guessing?) the maximum TOTAL dose of acetaminophen -- i.e., including other meds it's in -- over a 24 hour period is four grams (4000 mg) or eight extra-strength pills. That's cut in half for someone who drinks alcohol -- so what happens if you're taking other pain meds like opiods? In short: the less you add Tylenol to whatever meds they're giving you with Tylenol already added, the better. One can recover from a bleeding ulcer caused by taking too much aspirin. But liver damage from Tylenol can be fatal. Hi Tamar, your concern is appreciated. I had a conversation with a good friend of mine who is a pharmacist. She told me, TAKE THE OPTALGIN and do not worry about it. It it NOT dangerous. And yes, I am fully aware that Tylenol is dangerous if too much is taken as it can cause irreparable liver damage. Thank you again! Your memory is accurate regarding the recovery room episode (where I gave you the "OK" sign with my fingers and smiled). Your surgeons were quite concerned at your shivering and ordered thick heated blankets "Not thin cotton like she has. Thick heated blankets! NOW!" for you, but perhaps you were then too much under the anesthesia to remember. I knew you were fine when you conversed sensibly with me and later expressed a desire to eat. The nurses in recovery and on your unit were outstandingly thoughtful of your communicative needs. They pantomimed and spoke loudly for you. A few of them wrote notes on a clip board to ask if you have drug sensitivities, if you need/want something etc. Remember how I showed you how to compensate for the busted safe? I placed your personal items in the cute, empty and clean paper bag which came with the meal i'd bought for you at Yashpro Center. I camouflaged the personal items with new napkins and a magazine. Um, one caveat: I'm no fan of Optalgin. If you can take something else, do. I see the above friendly warning about Tylenol, so please review some user-friendly painkillers with your medical team please please please. Thanks Yocheved. Having you there with me made a huge difference for me. It made me feel safer, supported, and cared for. And yes, I agree, I felt that I was treated with utmost respect and care. There were a few times during my stay (after you left) in which I felt that there was some lack of coordination or communication between nurses, doctors, and myself but they were minimal. I do remember your creative "camouflage" of my items and it was thoughtful. With regard to the blankets I remember you telling me about that but I have no memory of it. It is interesting that on Sunday at about 5 PM, Dr. Goldman came to see me and I started having chills while he was there. I seem to be having chills about once a day -- It is how my body responds to trauma. When I started having chills while Dr. Goldman was there he was very concerned about that. He thought I might have a fever but I knew that I did not and I told him this is how my body copes with trauma. I am now spending whole days in pain (albeit somewhat reduced by the painkillers) and the chills are, to my mind, normal response. This is absolutely the MOST traumatic experience my body has undergone. With regard to the Optalgin, given that I am not having any nasty side effects of using it and that I have been reassured by three doctors and a pharmacist that it is fine, I am going to continue to take it. There are very few non NSAID options out there and all (including Tylenol and Optalgin) have their own set of issues. I have also been told that I should be okay with taking a second dose of Percocet - I can space them 6 hours apart. If I am in pain then I have no inclination to move about. But if I am not in so much pain, then I will be more inclined to move about and that activity is conducive to my healing. Chills and/or trembling are the body's built-in coping mechanisms for releasing physical and/or mental stress. It does not make sense to order someone to "Calm down! Stop shaking! It's not that bad!" That cruelty negates the very real conscious or subconscious sense of trauma for the affected person. When you tremble or shiver, ask yourself to find the calmest part of your being. It can be physical or emotional, spiritual, mental: Whatever the answer is, it is correct. Cling to the calmest part with sheer willpower/choice. Ask it to spread around you. Let the healing work on its own clock. By permitting yourself to heal with permission and gentle coaxing instead of feeling forced (e.g., being ordered to "Heal or else I'll give you something to heal from and you won't like it! "), your body's natural healing mechanisms will work rather flawlessly. I agree wholeheartedly that this is what chills are about which is why I do not get worried about it. I just recognize that my body is having a response to some trauma, or stress and I just let it go. In fact, twice today, I experienced this. Dr. Goldman was not telling me to calm down. He was just expressing concern that I might have a fever since chills are sometimes associated with that. I assured him that I did not have a fever and that this was just my body's response to trauma. He let it go and was fine with that response. I read something interesting about him. He is engaged in a study of pain management in children following surgery. It is nice that he considers pain management within the realm of his work. Many physicians that specialize do not reach out to try and capture a more "wholistic" approach. I have felt that he is in touch with most if not all aspects of my recovery.